New Delhi: Security measures in the Delhi Metro have been put on maximum alert with commuters made to undergo a thorough frisking in the wake of an explosion in a subway train in Russia that killed at least 10 people. Officials said the Central Industrial Security Force (CISF), tasked to secure over 150 stations of the rapid rail network with a daily footfall of about 26 lakh people, has issued orders to exercise the “highest possible measure of alert” by strengthening regular security drills and undertaking pat-down (complete) search of the passengers. They said all entry and exit points of the Delhi Metro stations will be effectively secured in close coordination with the Delhi police and Metro authorities. Special instructions, they said, have been issued to effectively and minutely scan the luggage of the commuters at all the stations, especially which receive a heavy passenger load and at inter-change stations like Kashmere Gare or Rajiv Chowk. Intensive “sweeping” of the stations with the help of anti-sabotage gadgets and canine squads will be undertaken, they said, adding armed commando teams of CISF’s quick reaction teams will be on all-time alert. “The measures have been put in place keeping in mind the enhanced security of the Delhi Metro in the wake of the blasts in St Petersburg in Russia. Instructions have been issued that passenger convenience is kept as the priority and minimum hassles are rendered to commuters,” a senior officer said. The CISF and Metro authorities have also been asked to use the public address system at Metro stations to effectively disseminate any information to commuters. The CCTV control rooms of the network have also been asked to keep a close eye on the activities inside and outside the station area, they said. 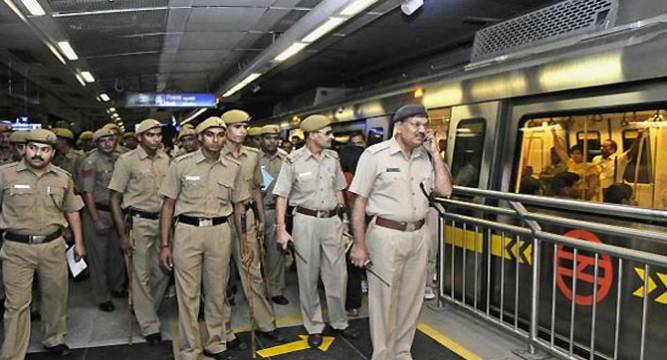 Over 4,500 CISF personnel are deployed to secure more than 150 stations of the Delhi Metro in the national capital and its satellite cities Gurgaon, Faridabad, Ghaziabad and Noida. At least 10 people were killed and 50 others injured today when an explosion ripped through a subway train in St Petersburg.